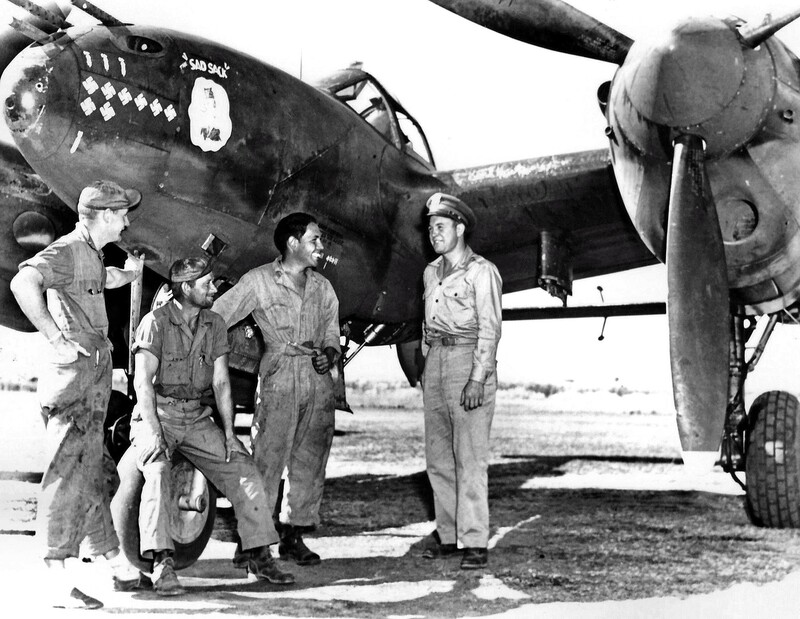 Aerodrome technicians and American pilot Lt. William “Dixie” Sloan near their P-38F fighter No. 43-2112 “SAD SACK” at the airfield in North Africa. 95th Fighter Squadron. Lieutenant William Sloan has just won his eighth victory (Messerschmitt Bf.109) out of twelve recovered during the war. The inscription on the P-38 “Lightning” of William Sloan – “Sad Sack” – is the name and the hero of the popular American comics (and then the cartoons) invented by Sergeant George Baker during World War II and published in the periodical for American soldiers “Yank, the Army Weekly “from June 1942.